I get asked about this picture the most. I wanted to make an image that had both strong eye contact and visible teeth, to bring out the character and personality of this crocodile. I slowly and cautiously approached, maintaining strong eye contact and light fin movements to avoid stirring up the silt. 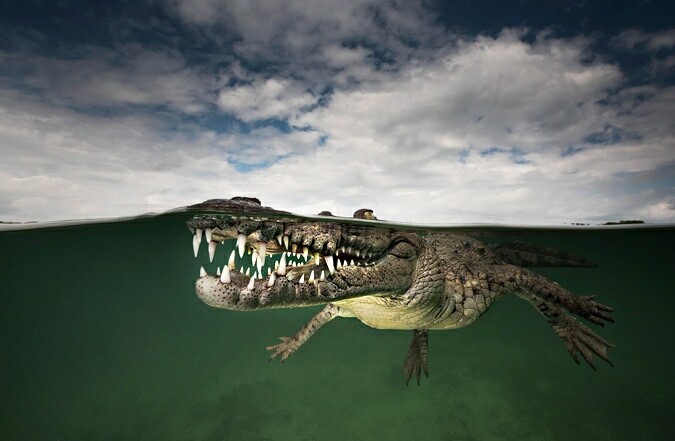 The crocodile remained motionless, with just its yellow, periscope-like eye staring straight back at me. It felt like a standoff. Who would falter first? Rarely do I remember the exact moment of pressing the shutter on “the shot of the day,” but I do remember every detail of this one: pulling focus, framing up, the sweat beading on my forehead, holding my breath, and my heart pounding in my chest. Confident that I had gotten my shot in just a couple of frames, I slowly backed away and returned to the boat. Mind blown! This is a silky shark, and it was one of hundreds surrounding our boat. 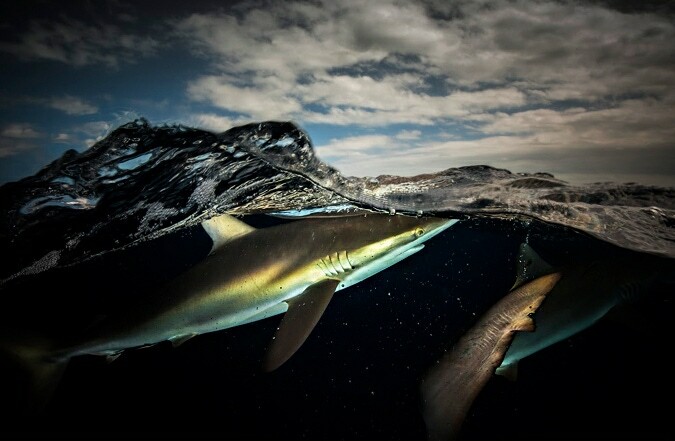 Shooting these sharks was an incredibly difficult task, and not because they were hard to find. On the contrary, there were often too many, and they move fast. So, singling one out for an intimate portrait was quite frustrating. Luckily, this one slowed down just long enough to capture the shot. These guys aren’t shy, but they’re not aggressive either, if approached correctly. 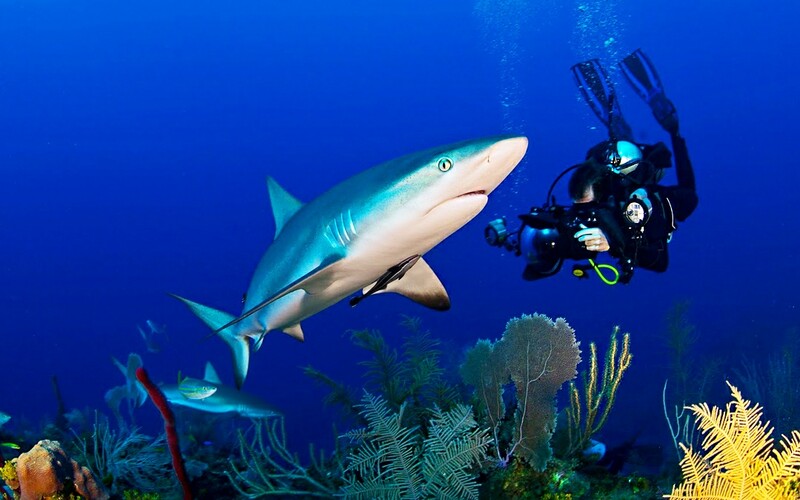 They will swim right up to your camera and push it with their noses to try to figure out what it is. Perfect for photography! 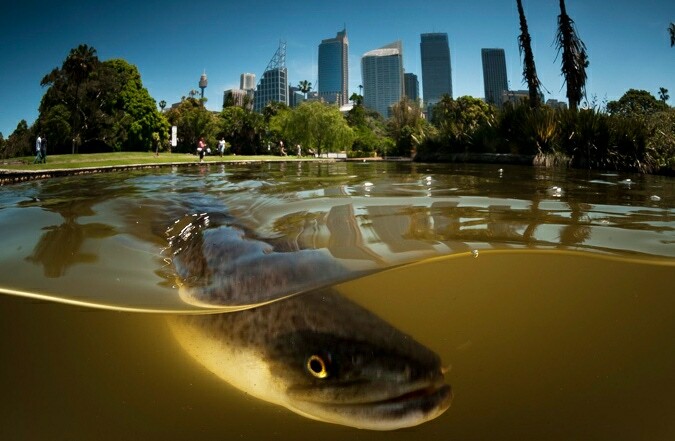 This shot of an eel in Sydney Harbor was actually quite easy, since I could stay dry. I got it by kneeling on the edge of a path and lowering my camera into the water. The natural curiosity of these animals brings them right up to my lens. I made a picture of this longfin eel because it has an incredible story and I wanted an excuse to share it. This eel, along with all its friends, would have been born 2,000 kilometers away in the South Pacific. Upon its arrival in Sydney Harbor it would have waited for a wet and stormy night to exit the sea and slither across the grass into this freshwater pond. Here it will live for the next thirty years or so before the urge to reproduce becomes overwhelming and it will make a return journey to its birthplace, where it will breed and then die. They’ve been doing this for millions of years, long before the first settlers arrived in Australia. Amazing! Lighting was the most critical component of this image. 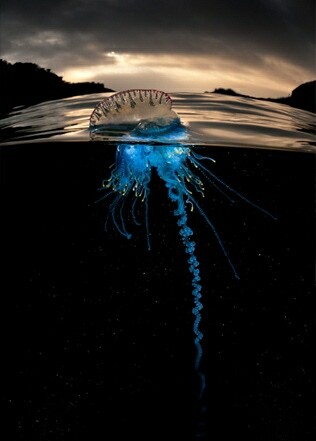 I needed to retain the desired darkness of the water, yet pick out the detail of the animal. This took lots of experimentation with different techniques over several weeks. Eventually, using fiber-optic snoots on my underwater flashes enabled me to pick out just the right amount of detail without overexposing too much of the surrounding ambience. I shot this image right out in front of where I used to work. 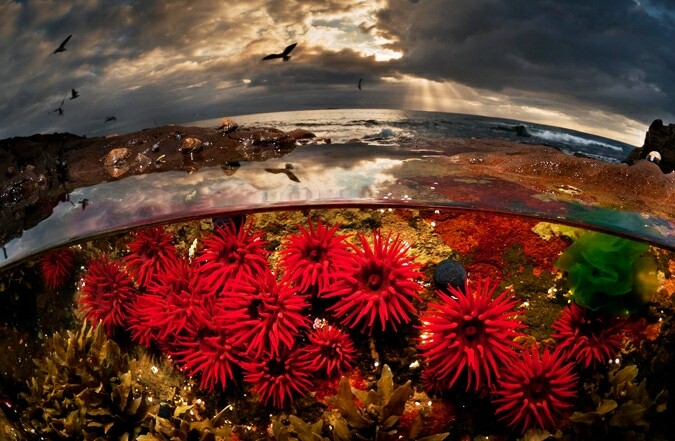 During my lunchtime walk I had found this tiny tide pool containing these wonderful bright red waratah anemones. I knew I had to take a picture of them. I also knew I could only shoot at the lowest of tides and that I wanted it to coincide with a nice sunrise; so it was to be a long waiting game. In the meantime I experimented with stripping my camera down to make it as small as possible so I could fit it into the tiny pool and get the shot. Eventually, the perfect morning arrived. The natural light was beautiful and the picture worked out just how I wanted it to. The silver gulls hovering in the background were a lucky addition. Being an ocean photographer has led me into some strange and curious habits. Wading around in tide pools in the middle of the night is one of them. However, the rewards can be fantastic from a photographer’s point of view, such as finding this nudibranch in just inches of water. Photographing it from a low angle just beneath the surface has created this wonderful reflection on the underside of the water. 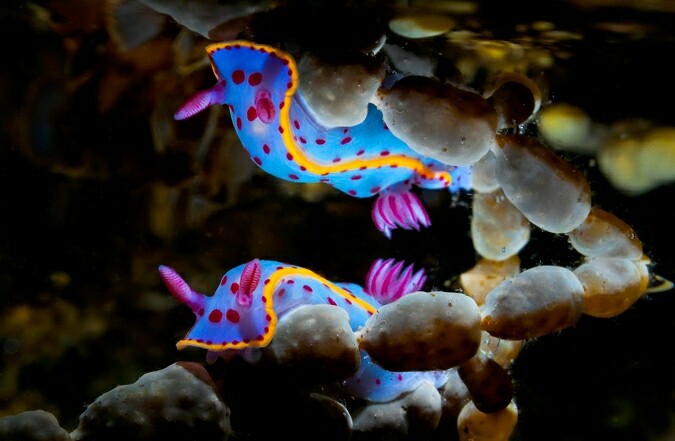 Nudibranchs inhabit every ocean, from depths of a few inches to thousands of feet. They come in every conceivable color and pattern combination, and they can perform a really neat trick: They feed on toxic sponges and hydroids and absorb the toxins, which they then redistribute around their own body to use as protection from any would-be predator. Prints are available for all of Matty Smith’s images at www.mattysmithphoto.com.